A “dead” body in the front passenger seat of a car is covered with a white sheet following a mock collision to highlight the dangers of distracted driving during The Last Text Monday morning at Palmdale High School. 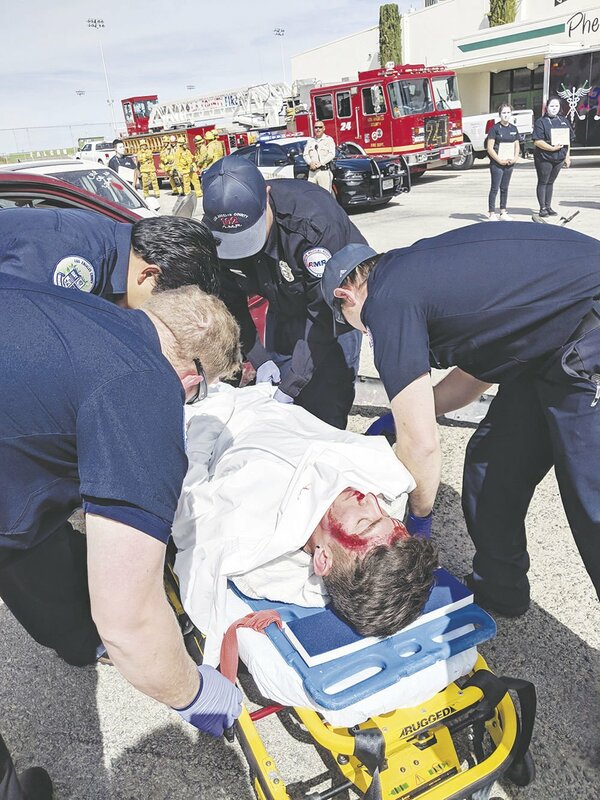 Palmdale High School student Isaac Talavera portrays a victim of a distracted driver to highlight the dangers of distracted driving during The Last Text mock collision Monday morning at Palmdale High School. The Grim Reaper accompanies the “living dead” students in a mock cemetery at Palmdale High School Monday morning during The Last Text event to highlight the dangers of distracted driving. PALMDALE — The Jacob Hefter Foundation and Palmdale High School collaborated for The Last Text event Monday morning to raise awareness about the dangers of distracted driving. Palmdale High juniors and seniors gathered near the school’s large gymnasium to watch as first responders from the Los Angeles County Fire Department, Los Angeles County Sheriff’s Department, California Highway Patrol, and American Medical Response ambulance service responded to a mock traffic collision caused by a distracted driver, senior Yershanie Madrid, who admitted she texted before the collision. According to the scenario, Madrid suffered minor injuries in the collision. Her vehicle hit another car driven by Sarahi Perez, who suffered serious injuries. Perez’s passengers, Isaac Talavera and Alejandro Maldonado, were killed in the mock collision. A pedestrian, Desirae Castillo, suffered minor injuries, and a bicyclist, Adam Vidana, suffered major injuries. High Desert Towing assisted by delivering the cars. Seniors Madrid, Matthew Garcia, Felicity Heesch, John Dino and Sophia Grande collaborated on the program with the Jacob Hefter Foundation for their senior project. Students Karla Panduro and Jackie Cruz did make-up for the dead and injured students. Garcia added although Monday’s collision was staged, they wanted to make sure their peers realized it could happen anywhere if you drive distracted. Garcia decided to do The Last Text as his senior project after he saw a similar program at school one or two years ago. Heesch said they also wanted to bring awareness about other types of distracted driving, such listening to music, or talking with your friends. Heesch learned about The Jacob Hefter Foundation her freshman year. The foundation was named after Jacob Hefter, a 2008 Palmdale High School graduate, who was among 25 people killed Sept. 12, 2008, when a Metrolink train collided head-on with a freight train in Chatsworth. The engineer had been sending text messages and missed a railroad signal. Hefter was the son of Alan and Angela Hefter, a Palmdale High teacher and coordinator of the Health Careers Academy. Now that she is a licensed driver Heesch pledged not to text and drive. Madrid first heard about The Jacob Hefter Foundation from one the assemblies they do each year. She volunteered to be the distracted driver because she wanted to see how it would feel if she was actually in that situation. “It impacted me a lot. I didn’t expect it to impact me that much because when I went in I was like, ‘Oh, this is fake, it’s not going to make me feel that scared or anything.’ But when the cops started talking to me everyone’s just looking at me. I looked around and I saw all these people that were hurt. It felt so real and the way the cops were treating me,” Madrid said. The Last Text participants visited a local law firm to hear about the judicial and legal consequences of the actions of Distracted Driving. California Highway Patrol officer Gil Hernandez addressed the crowd of students who gathered to watch the scenario play out. Hernandez added more than 3,000 people die each year as a result of distracted driving. Hernandez said afterward that it is frustrating when he comes on the scene of a collision where a driver was driving distracted. He noted there are many programs that create awareness about distracted driving, such as The Hefter Foundation and programs for teens and adults through the California Highway Patrol and California Office of Traffic Safety. Capt. Ryan Jameson of L.A. County Fire Department Station 37, in Palmdale, said they understand there are moments when they can do good, and others when they cannot. ‘We can kind of live for those moments when we can do good, and then recognize there’s times when people don’t walk away,” Jameson said. Jameson added they do not focus on the cause so much as the human condition and what they can do to make the person better. The Last Text is part of series of events this week put on by The Jacob Hefter Foundation for April, which is Distracted Driving Awareness Month. The Jacob Hefter Foundation 24-foot trailer will be at Quartz Hill High School from 11 a.m. to noon today, and from 3 to 5 p.m. at the softball field for the game between Quartz Hill and Palmdale. The teams will promote their message about distracted driving. The foundation’s trailer is equipped with texting simulators and banners available for students to pledge to be Text Free Drivers. Palmdale High students can take the pledge from 10 to 11:30 a.m. Wednesday in the school’s quad during lunch. The trailer will be at the Palmdale High softball field from 3 to 5 p.m. Thursday for another game between the Rebels and the Falcons softball teams for students to pledge to be text-free drivers. The week will culminate Friday at Palmdale High with an assembly for students that will feature the video made By Paragon Productions, and public service announcement created on Monday, plus impact statements from participating students and their families, and guest speakers.